An activist places crosses on the National Mall for victims of gun violence April 11, 2013 in Washington, DC. 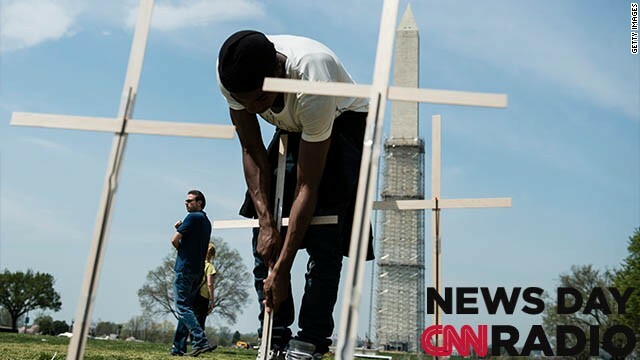 The activists gathered to begin a 24 hour vigil on the National Mall with over 3000 crosses for victims of gun violence in the United States since the Sandy Hook School shooting last December. Eileen McCormack is fighting with her lien holder to get the cash from a Sandy insurance claim. 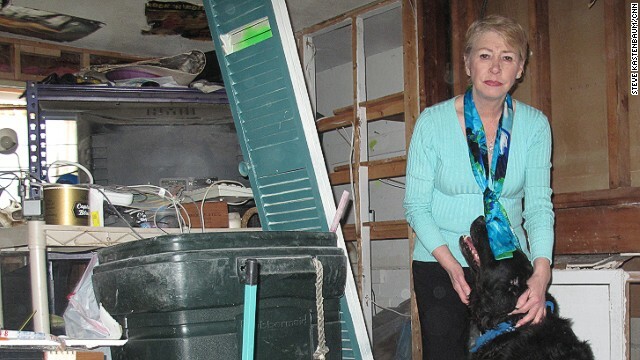 (CNN) – Five months after super-storm Sandy flooded tens of thousands of homes in New York and New Jersey many people are still fighting to get the cash already awarded to them by insurance companies. Some banks and mortgage companies are being criticized for holding on to the money. [1:45] “They are holding us hostage and I am very angry,” said Eileen McCormack, a homeowner in Freeport, NY who had over three feet of water in the first floor of her home. Her insurance claim was settled for over $50,000 but her mortgage company won’t release the funds. An agent told her it’s because she’s behind in her payments.